In March I participated in an Instagram Hop using the Pretty Little Studio – It’s Your Birthday FREEBIE Printable and I wanted to share that layout here with you today! This printable is only available through tomorrow (April 3, 2018) so be sure to head to the freebie section in the Pretty Little Studio Shop to download your copy. 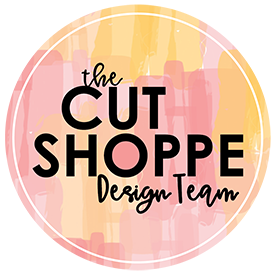 This printable will come in both PNG & PDF format so you can use it as a Print Then Cut file in your Silhouette or Cricut, or you have the option to just print the PDF and then fussy cut the icons. For my layout I started with a white cardstock background and added a wash of blue acrylic paint. I then positioned multiple die cuts from the It’s Your Birthday Printable around the layout to create a grid design. My photos are 3 photos of Aidan that were taken in 2010. I had brought birthday balloons home from work, and you would have thought I brought home the best present in the world! That kiddo has pure joy just written all over his face! I used two triangles from the printable and wanted to add another triangle element to the layout. So I took a scrap piece of paper and created a triangle template. I then used a pencil to trace the template and then stitched over those lines to add another layer of texture the background. I used my We R Memory Keepers Typecast Typewriter to add the journaling to the layout and also used a roller stamp from my stash to add a couple fun sentiments to the labels. Now you can take a look at my process video. If you’d like to see the other projects created with this Free Printable, you can head to my Instagram profile to follow along with the Instagram Hop. This hop did take place on March 20, so scroll down on my feed until you see a photo of this layout. I’ll have the next person in the hop tagged in my Instagram post. The entire It’s Your Birthday Collection designed by Claudia Van R is available to purchase, but remember this printable will disappear tomorrow so head to the Pretty Little Studio Shop to download this free printable before it’s gone!